During the election campaign, Buhari frequently assured Nigerians that he would stop the insurgency: in his word “Our government will bring to an end the menace of Boko Haram terror that is plaguing the society. Nigerians are turning into refugees in their country,” he said during a rally in Adamawa. What we save from the fight against corruption and leakages, we will invest heavily in education, infrastructure, equipment, and teachers. Following a heavy Boko Haram terrorists’ attack which left three UN workers dead. According to reports, the Boko Haram insurgents attacked the Rann Internally Displaced person camp late on Thursday, during which the UN workers were killed. Two of the deceased workers were with UN agency; International Organisation for Migration, while the third victim was a doctor, working with the UN Children’s Fund. A female UN nurse was also reported to have been abducted by the insurgents. Report has it that apart from the officials, a yet-to-be-ascertained number of civilians in the camp were also killed while many others were injured during the gun battle. 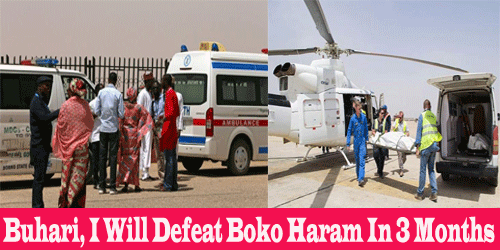 The Boko Haram terrorists reportedly abducted three aid workers and civilians apart from the UN nurse. Two of the abducted workers are reportedly working with the International Committee of the Red Cross – another major international relief agency in the North-East. Just N10,450. And Now Making Over 350k Monthly.. Get The Full Course Here! 0 responses on "Buhari, I Will Defeat Boko Haram In 3 Months, 3 Years Later This Happened"